Nobis Hotel: Located on Norrmalmstorg Square, just steps from both the harbor and an upscale shopping district, this chic and contemporary boutique hotel mixes cutting-edge design with an international flair (the owner, Alessandro Catenacci, is Italian) and a strong sense of local history. 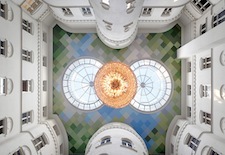 The 201-room Nobis opened in early 2011 in two adjacent late-19th-century buildings (both former upscale residences-turned-banks, with the southern building the setting of a hostage standoff in 1973 that inspired the term "Stockholm Syndrome"). 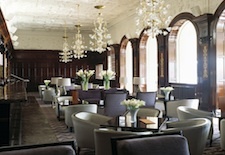 Although the eye-catching décor in the entryway, lobby, lounges, and rooms is 21st-century sleek, rich historical details remain: The Lounge is set in a courtyard-turned-atrium with a dramatic, 92-foot-high ceiling (shown at right), the focal point of which is a shimmering Orrefors crystal chandelier representing a squid, and four separate living room areas, where it’s enjoyable to sip a glass of wine (all from Italy) and people watch. In the other building, you’ll find a rare 19th-century, hand-wound clock that still runs and a stunning spiral staircase that looks like the inside of an exotic seashell when viewed from below. The hotel’s restaurant, Caina, is located on the lower level and serves classic Italian fare, while the buffet breakfast is “Swedish ecological,” with products sourced from local farms. Stockholm in winter inspired the room's subdued hues: gray, black, and camel paired with dark polished wood flooring. 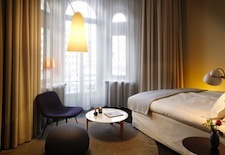 Beds are ultra comfortable with plush duvets, and all bathrooms are compact yet bright with sleek chrome and Carrara marble. Standard rooms, at 194 to 237 square feet, are on the small side, so book at least a superior (248 to 280 square feet) or even a deluxe (290 to 355 square feet, shown at left). The 10 suites measure 344 to 570 square feet and feature a bathtub and separate shower. The top accommodation is the two-room, 1,055-square-foot Nobis Suite with original 19th-century wood panels and a dramatic canopy bed. Rooms start at $398/night. The Grand Hotel: If these walls could talk, what tales they might tell. Since its debut in 1874, this now 330-room luxury landmark has hosted everyone from Henry Ford and Albert Einstein to Charlie Chaplin and Elizabeth Taylor. But the Grand Hotel is perhaps most memorably linked with both the notoriously reclusive Swedish star Greta Garbo, who stayed here many times, and the Nobel Laureates (winners of the annual Nobel prizes from Literature to Physics), who have been hosted here since 1901. History lovers couldn’t ask for a better setting. 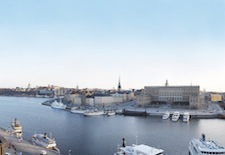 Located on the waterfront with a view across to the Royal Palace and Old Town (shown at right), the hotel’s interiors have been deemed a “Swedish National Treasure” – most notably the Hall of the Mirrors (a stunning gold ballroom dating to 1899). The gastronomy is also epic, as the Grand has been home to famed Swedish chef Mathias Dahlgren’s Michelin-starred restaurant since 2007, offering two different experiences, the Matsalen (Dining Room) and the Matbaren (Food Bar). The hotel is also home to The Verandah, serving contemporary Swedish fare, and the popular and recently renovated Cadier Bar (shown at left). All venues draw from a 20,000-bottle wine cellar that includes selections from 1874, the year the hotel opened. Décor in the 368 rooms and suites is classic and elegant, but varies greatly from floor to floor and category to category (since 2006, the hotel has comprised two buildings, the original and the adjacent Burmanska Palace). Many feature antique furnishings and rich fabrics, but the latest update to 37 flagship rooms and suites on the first and second floors of the original building has added a “timeless” and environmentally friendly undertone in shades of gray, champagne, mother of pearl, and dusty pink (shown at right). Suites are spacious, and superior and deluxe rooms measure 377 to 484 square feet; the best face the water and have wonderful views. A major romantic perk is the luxurious Raison d’Etre Spa, which offers not only indulgent Nordic-inspired facials, massages, and more but also a Spa Suite that looks out on the Royal Palace, where you can book the “Honeymoon,” a three-hour couple’s scrub, steam, massage, bath, and champagne ritual. Room rates start at $483/night. See our Stockholm Travel Guide for more trip-planning information, then use our Travel Search price comparison tool to find the lowest rates on flights, hotels, packages, and more travel deals.